At exactly 5 p.m. one recent Friday at Taisei Co., a flying drone alerted workers at the building maintenance firm that the day’s work was done. The fully automatic drone, which goes by the name T-Frend, is an example of the unique ways unmanned aerial vehicles are being used to seize control of what people are failing at or incapable of. “This drone will identify who remains in the office after hours. . . . And by accessing recorded data, human resources or administration departments will be able to deal with those who abuse overtime,” said Chikara Kato, manager of the Tokyo firm’s corporate planning division and inventor of the device. In recent years, Japan has been strengthening efforts to limit overtime amid outrage sparked by the continuing deaths caused by Japan’s excessively long working hours. 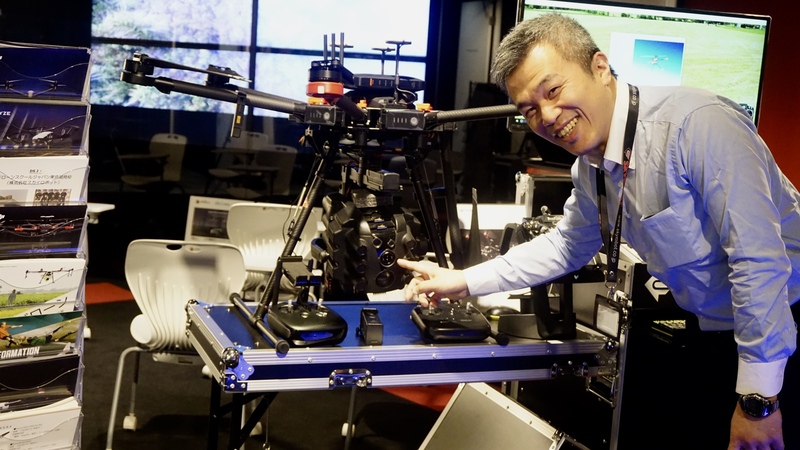 “At first, we considered flying drones over parking lots to use them in place of security guards,” but instead we invented a system to fly drones inside of buildings as it doesn’t need to meet Japan’s strict aviation restrictions outdoors, Kato said. T-Frend, which is being used on a trial basis, was developed by Taisei using the technology of drone developer Blue Innovation Co. and telecommunications giant NTT East Corp.
Taisei said it will start marketing the unusual office service in October. Weighing several hundred grams, the rechargeable drone, which also takes video, can fly at a height of around 2 meters for up to 15 minutes. The system doesn’t require a pilot and transmits its data directly to a cloud-based storage system. It can also improve security, Kato added. Drones aren’t just being used to watch over humans. Municipalities nationwide rely on such technology to track and scare off crop-damaging wildlife in rural areas. The city of Minokamo in Gifu Prefecture scares marauding macaques from fields using sounds emitted by drones. “Monkeys are smart enough to avoid traps. . . . And we’ve come up with an idea to use drones to teach them a lesson,” said Yuki Yamada, an official with the city’s agricultural and forestry division. Crop losses in Minokamo caused by macaques top nearly ¥2 million per year, but the animals “also damage roofs and invade warehouses, so the damage is much more significant,” she said. Since October, the city has been dispatching teams of “monkey chasers” who broadcast Minokamo’s official melody through speakers attached to the drones once or twice a month. Simultaneously, hunters shoot off air guns and fireworks at invading macaques to scare them off. Some monkeys have fled to other areas since the project was launched, she added. Kanagawa Prefecture is testing a new drone-type robot specifically designed to deter the crop-damaging macaques. 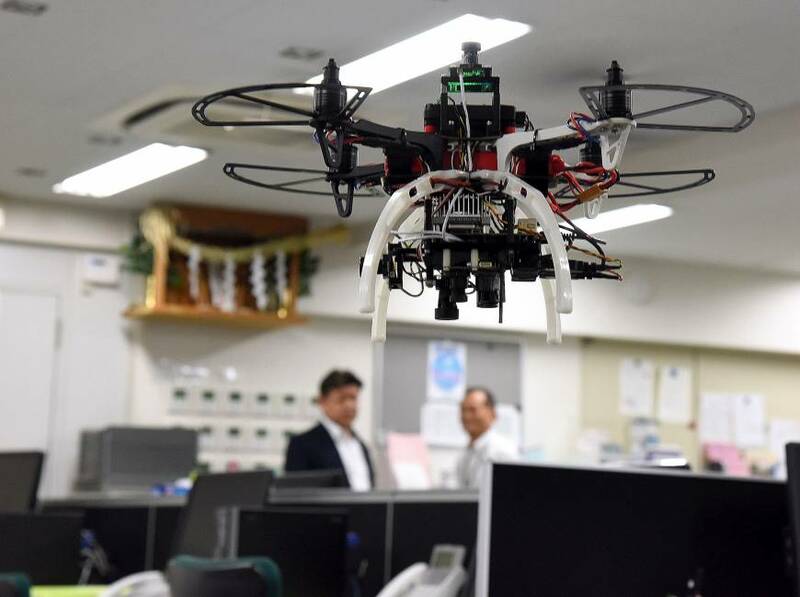 “We’ve thought of using drones as monkeys are simply afraid of them,” said Takatsugu Nemoto, an inventor at Meiko Electronics Co. who is building a system for the prefecture’s ¥10 million project. Meiko’s system also tracks macaques fitted with collars that emit GPS signals. The drones can follow them as they move around with their families. The pilots can then buzz any monkeys spotted invading farmland and scare them off with the speakers. The Kanagawa Prefectural Government ran three tests last year in mountainous parts of Atsugi and plans to train operators in Sagamihara later this year, an official with the prefectural government’s industry promotion division said. Startup Skyrobot Inc., another Tokyo-based drone firm, dispatches teams to track bears, deer and boars using Sky Animal drones with infrared cameras. “We’re also thinking of creating drones that would release nets to actually capture wild animals,” said Tony Lin, Skyrobot’s technical sales representative. The company also sells and rents drones that can spread 10 kg of fertilizers over a 1-hectare field in just 10 minutes. The venture is currently working on hydrogen fuel technology that would allow drones to fly for about three hours, compared with just 30 minutes for battery-powered current models. In the future, flying vehicles will become a reality, and drone companies are seeking new technologies that will allow people to ride them, Lin said.